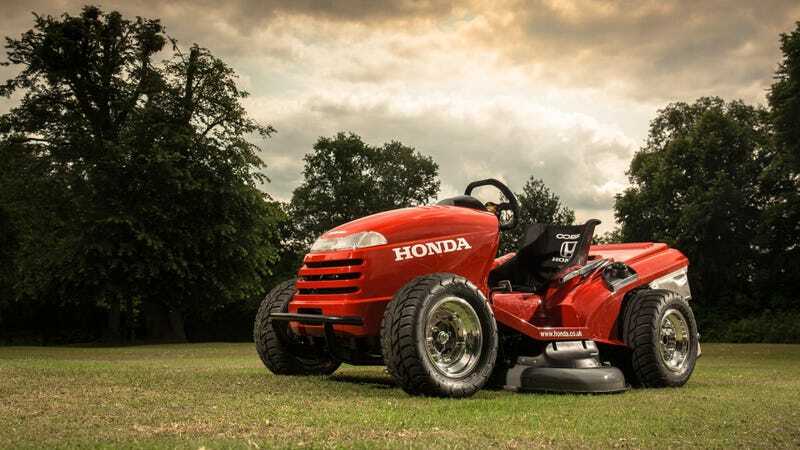 Honda took their HF2620 Lawn Tractor, gave it a new chromoly chassis, a custom body, ATV wheels with bespoke suspension, and the 1000cc engine from a VTR Firestorm motorcycle. They call it the Mean Mower. Honda created this 308 pound monster with their title winning British Touring Car Championship partner, Team Dynamics, then gave the keys to reigning BTCC champion and Honda Yuasa Racing driver Gordon ‘Flash’ Shedden. But the best thing about it? It's still a lawn mower! Thanks to two electric motors on the cutter deck spinning 3mm steel cutting cable at an incredible 4000rpm, the Mean Mower can cut grass at around 15mph. Effective park management? Hell yeah!